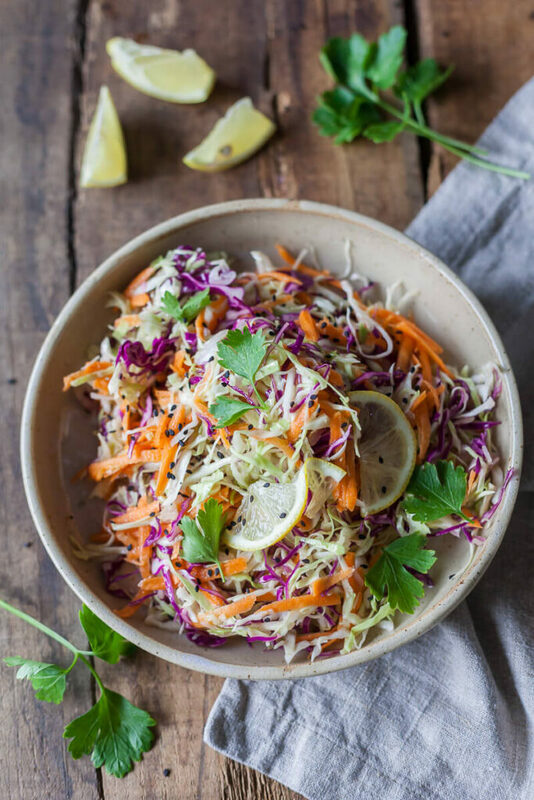 Vegan No Mayo Coleslaw is a light and fresh summer classic without the calories! Just fresh vegetables and a delicious mustard dressing. Sumer barbecuing is in full swing now and we have finally our first heat wave of the season! Are we excited? Yes, and no, of course. I mean, it’s nice to finally wear a short skirt and flip-flops, but getting in the car is a sweaty nightmare. How’s the summer treating you? Hope you’re staying cool and hydrated! With the temperatures on the rise, we have embraced cold foods and salads. 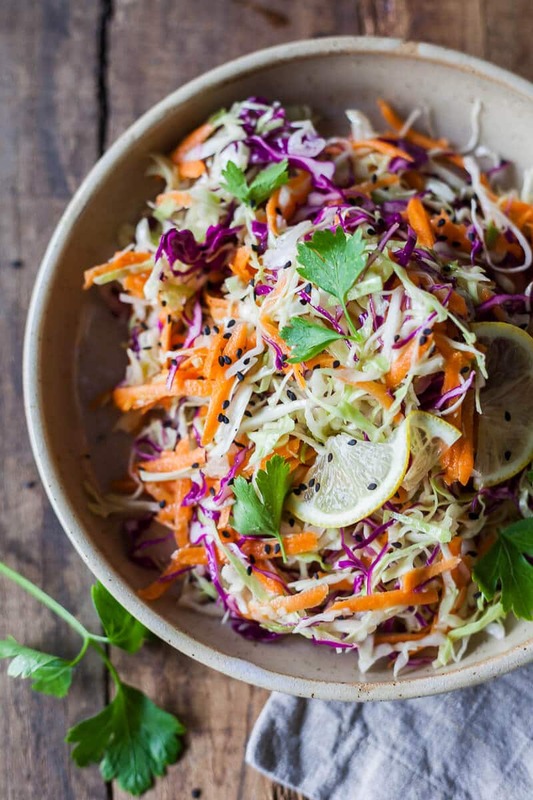 And this Vegan No Mayo Coleslaw is the perfect summer salad! Light, fresh and crunchy, this is your perfect grill companion, but without the heavy cream or mayo. 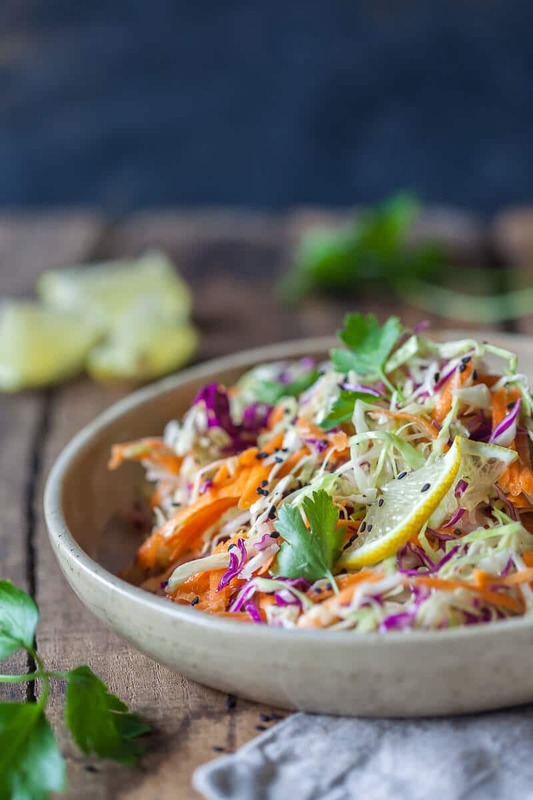 This Vegan No Mayo Coleslaw only uses fresh and light ingredients: crunchy cabbage, sweet carrots, onions and a refreshing mustard dressing that you simply shake together in a jar. 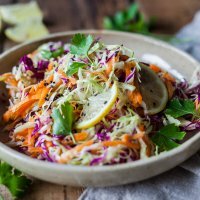 This salad couldn’t be easier to make and if you use a food processor to shred your veggies it only takes 5 minutes top. Shred cabbage or cut into fine slices. Peel onion and finely slice. Peel carrot and grate coarsely. Place vegetables in a large salad bowl, add chopped parsley and optionaly black sesame seeds. Prepare mustard dressing: in a jar, add balsamic vinegar, lemon juice, mustard, olive oil, salt and pepper to taste. Close jar with a lid and give it a good shake to combine. Pour mustard dressing over the salad and toss to combine. Serve.